The Paliam Eswara Seva Trust at Chendamangalam has released the book on History of Paliam both in English and Malayalam at a glittering function held at the Century-old Paliam Nalukettu in Chendamangalam on the 24th of August 2013 and coincided with the launch of this very Web Site. This authentic record of the genesis and life of the Paliam family through centuries as incorporated within the history of Kochi. 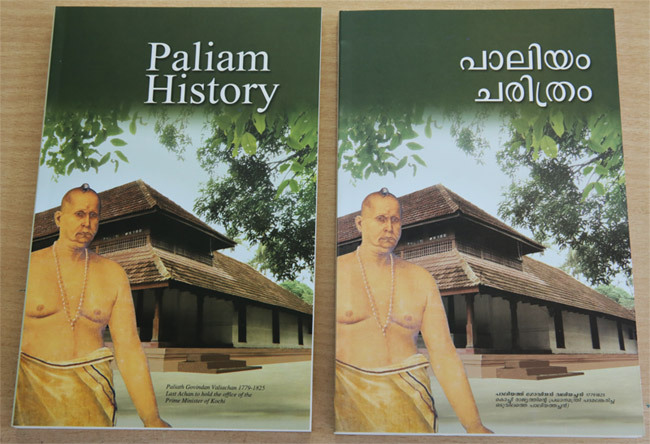 The book traces the roots of Paliam family, its association with the Perumpadappu Swarupam and Thiruvanchikulam and its shift to Chendamangalam in the 14th Century and evolution of Paliath Achans as the lord of Chendamangalam. The book also provides a brief sketch of the family�s heritage and also impressions of a joint family of a bygone era.